• Wet’n’Wild Las Vegas is giving first responders two complimentary tickets to Halloweenville from Oct. 20-31. Tickets will be available to first responders including active duty police officers, state highway patrols, firefighters, emergency medical technicians and paramedics depending on park occupancy. Tickets can be picked up at the Wet’n’Wild box office after 5 p.m. with both state issued and staff identification and will be available for same-day use only. Halloweenville is open 5:30 to 10 p.m. Friday to Saturday and 5:30 to 9 p.m. Sunday to Thursday. Wet‘n’Wild is at 7055 S. Fort Apache Road near Interstate 215 and Sunset Road. For information call 702-979-1600 or visit www.wetnwildlasvegas.com. For more information on Las Vegas Halloweenville, call 702-899-1109 or visit lasvegashalloweenville.com to purchase tickets. • Downtown Brew Festival, Motley Brews’ backyard beer bash, has announced its lineup of brewery and culinary participants, musical acts and VIP chef for the sixth annual event. A silent auction to benefit the Las Vegas Victims’ Fun has also been added to the festival, which returns to Clark County Amphitheater on Oct. 21. The VIP Pavilion, which opens an hour early at 4 p.m., will pour exclusive rare craft beers paired with samplings of cuisine by Chef Joshua Clark. He will prepare popular selections from The Goodwich, his chef-driven sandwich shop that features made-from-scratch ingredients. More than 60 breweries are on tap to pour nearly 200 craft beers. Local breweries include PT’s, Record Street Brewing Company, Banger Brewing, Hop Nuts Brewing, Tonopah Brewing Co., Big Dog’s Brewing Co. and Lovelady Brewing Co. Out-of-state brewers include: Hop Valley Brewing from Eugene, Oregon. ; Stone Brewing, from Escondido, California; Latitude 33 Brewing, from Vista, California; College Street Brewing, from Lake Havasu City, Arizona; Shades of Pale Brewing, from Park City, Utah; and Barley’s Brewing Co., from Columbus, Ohio, among others. Local restaurants and food trucks will showcase culinary offerings at “Festaurant Row,” including QFS Tacos, Urban Turban, Donut Bar Las Vegas, Mochiko Chicken, The Black Sheep, Sin City Wings and Oming’s Kitchen. Downtown Brew Festival also brings an extensive lineup of live musical acts including indie rock sensation Naked Elephant; genre-defying five-piece band, The Routine; hip-hop artist Mike Xavier, and more. Tickets to Downtown Brew Festival start at $40 plus fees for general admission, which includes access to the event from 5 to 9 p.m. along with a tasting glass, unlimited beer samples and live music. Early admission tickets are also available with entry at 4 p.m. and access to exclusive beers, priced at $45 plus fees. More information about Downtown Brew Festival is at www.downtownbrewfestival.com. • City National Bank has donated $25,000 to the Las Vegas Victims’ Fund in support of the victims and families affected by the recent shooting tragedy. A sister company of City National, RBC Wealth Management, also made a significant donation to the American Red Cross totaling $25,000. • VegasCares show will be held Nov. 5. from 1-4 p.m. at The Venetian. The show will feature local entertainers, honor first responders and raise funds for the victims and their families. Scenic designer Andy Walmsley has agreed to produce a special set for the event and Cirque du Soleil has promised many of its performers will take part and create a special one-time production number for the tribute. Best Agency owner Ken Henderson is producing the star-studded event and Myron Martin from The Smith Center and will be artistic director. A special VegasCares logo has been created for the event with all proceeds going to the fundraising effort created by Clark County Commission Chairman Steve Sisolak and the National Compassion Fund. • Former Chicago mayoral candidate Businessman William Dock Walls and local entrepreneur Joe Notaro have launched the official #VegasStrong t-shirt with all net proceeds to benefit first responders. This community launch event, entitled “Putting You First,” was held Oct. 10 at the Welcome to Las Vegas sign, just blocks from the location of the Route 91 tragedy. While many other entities and organizations are focused on raising funds to assist the victims of the Las Vegas Strip mass shooting incident, Walls and Notaro are on a mission to provide relief for first responders and their families. All contributions should be made directly to the paypal.me/FirstRespondersFund. • On Oct. 7, more than 700 cars and bikes took over the west parking lot at M Resort Spa Casino for the #VegasStrong Charity Car Meet. Organized by Celebrity Cars Las Vegas, Hellkat Racers and 360 CarShow, the event raised more than $22,000 for the Las Vegas Victims’ Fund. 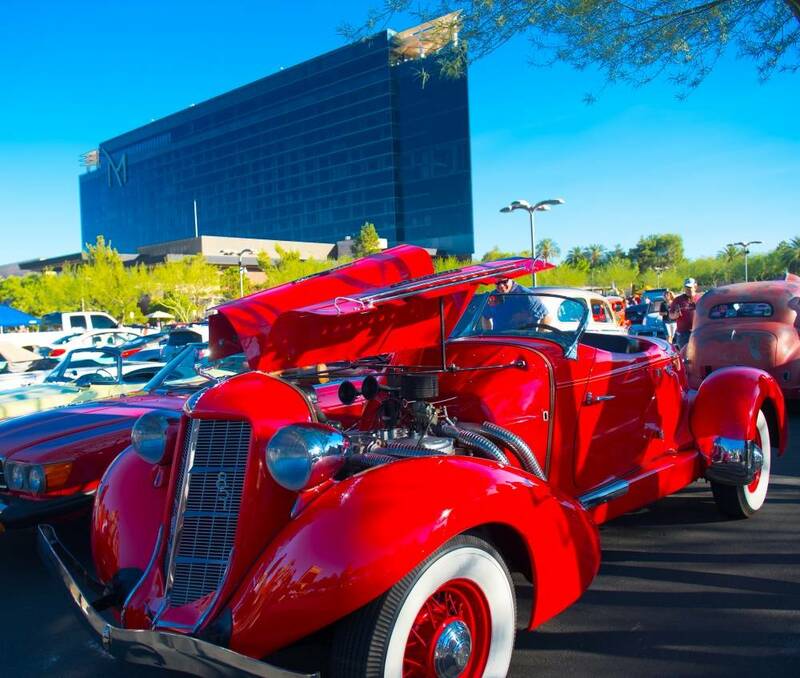 Sponsor of the car and bike show, M Resort and its parent company, Penn National Gaming, are donating the car meet beverage sales and matching the total proceeds, giving an additional $28,000 to the National Compassion Fund Las Vegas, established by the National Center for Victims of Crime. Both the Las Vegas Victims’ Fund and National Compassion Fund Las Vegas are working in tandem to distribute 100 percent of proceeds to the victims of the tragic Route 91 Harvest Festival shooting. • The horrific events following the mass shooting at the Route 91 Harvest Festival will leave more than just emotional scars. Many people will face a multitude of civil legal issues in the coming days, weeks and months. To help victims and their families deal with these matters, Legal Aid Center of Southern Nevada and the State Bar of Nevada have joined forces to provide pro bono legal services covering guardianship, immigration, employment issues, debt relief, probate, jurisdiction issues and other areas. Legal Aid Center of Southern Nevada Inc., a local nonprofit law firm, is accustomed to working with volunteer attorneys in the community through its Pro Bono Project. Additionally, several of Legal Aid Center’s staff attorneys and paralegals have been present at the Family Assistance Center to provide guidance to those with legal problems stemming from the Oct. 1 shooting. Examples of civil legal issues victims may face include: guardianship over an orphaned child, custody orders, help when debt collectors call on past due accounts because a household provider has been unable to return to work due to traumatic injury, property and probate matters, and assistance for out-of-state visitors needing help finding an attorney in their own jurisdiction. Legal Aid Center of Southern Nevada and the State Bar of Nevada have established a triage system to help individuals connect with an attorney. Those affected may call 702-386-1070, ext. 0, during the hours of 8:30 a.m. to 5 p.m., Monday through Friday, for assistance. • Chicago has landed a nine-show run at The Venetian starting Feb. 7 and the band is donating $1 for every ticket sold to the Las Vegas Victims Fund created after the recent tragic Rt 91 Harvest Festival gun massacre. shooting at an outdoor festival near the Las Vegas Strip. The donation will go to the Islamic Foundation of Nevada, which is in charge of disbursing the funds. The money will go to medical bills and funeral expenses, among other items. Islamic Relief USA, based in Alexandria, Va., is a nonprofit 501(c)(3) humanitarian organization.